Summer vacation for the boys is over, and now it’s back to the school time grind! Yes, you know the drill. September is in full swing, and the hustle and bustle is now in full effect. And Wet Ones® is here to help. 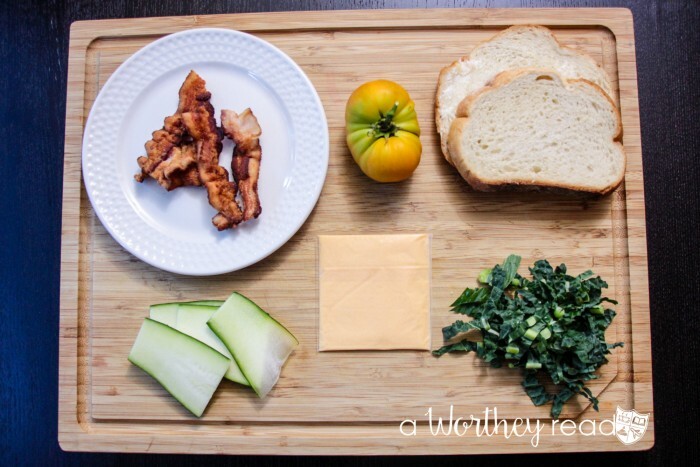 I got a kid loving Grilled Cheese with Tomato, Zucchini & Bacon Sandwich idea that will knock their socks off. Read on to find out the delicious + so fresh and so clean deets. Oh, the joy of it all! Who doesn’t enjoy, not only getting oneself ready in the morning, but getting the kids up, fed and out of the door (on time) too? As parents, we know having an effective game plan goes a long way in helping things run smoothly and perfectly perfect. And then there is coming up with delicious, fun and nutritious lunches five days a week that the kids will enjoy. And for some families school lunch isn’t always the best option for a lot of reasons, i.e. food allergies, other worldly taste buds or just picky eaters. For us, our boys just prefer bringing a lunch instead of dining on what their school has to offer. Honestly though, we kind of prefer it this way too because we get to pick and pack a lunch that’s choke full of healthier options like fresh fruit, veggies and whole grains. The boys love our Grilled Cheese with Tomato, Zucchini and Bacon. We call it the Cheesy TZB for short. But more on that later. OMGEE! where’s my coffee cup? But what takes place immediately after they’ve eaten? We seldom think about that. And guess what? The jobs not finished! Now it’s clean up time and Wet Ones® is the perfect solution. Because every great kid’s meal needs a little extra TLC afterwards. Wet Ones® is our extra TLC for our boys because it’s perfect for cleaning up messy hands after school time lunch. And did you know Wet Ones® Wipes kills 99.99% of bacteria? So, there may be 99.99 problems but tidying up after school lunch isn’t going to be one of them. For us Wet Ones® is a school lunch must have. Also, below I have the recipe for the Grilled Cheese with Tomato, Zucchini and Bacon sandwich! Butter two slices of bread on both sides. One one slice of bread add 1 slice of cheese, thinly sliced zucchini, tomato, shredded kale and bacon. Then add the additional slice of cheese and remaining slice of buttered bread. Heat a large skillet over medium heat, brush with extra virgin olive oil. Once the oil is hot add sandwich and brown on both sides. Remove to a clean cutting board and slice in half with a serrated bread knife. Allow the sandwich to cool then place in a sandwich container or sandwich bag. Get more creative lunchbox ideas and find out more about Wet Ones® ! What do you pack in your kids’ lunchboxes? Leave me a comment below, I would love to get more school lunch ideas!